Saturday Night Macon Speedway will pay tribute to any and all firemen with the Annual Fireman’s Ball. Scheduled earlier in the year and lost due to rain in the area the Fireman’s Ball reschedule date is now upon us. 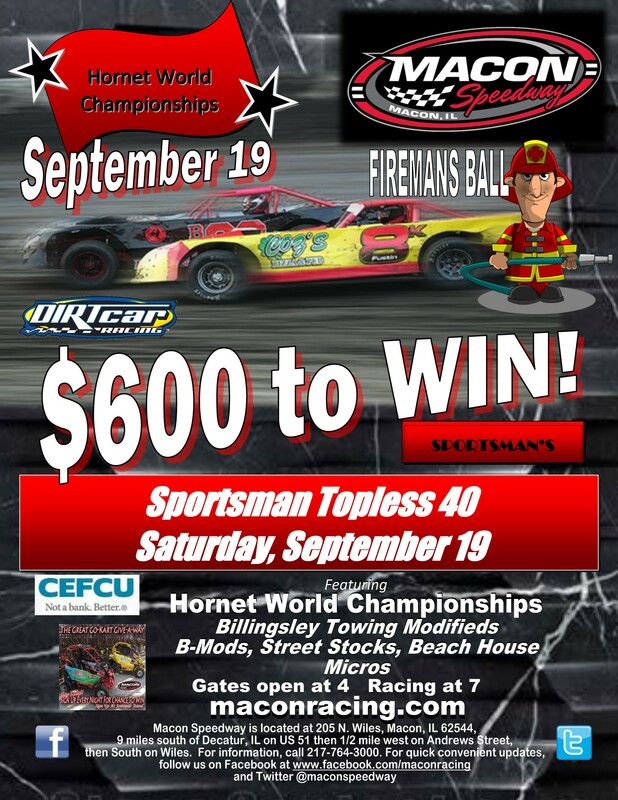 Area fire fighters and their families will be honored with a deeply discounted admission ticket of just $5 for the evenings racing festivities. All fire fighters need to do is show proper identification or wear something to show your affiliation with an area fire department. The tickets dated for July 11 will also be honored. General admission gates are set to open at 5pm, hotlaps at 6pm with racing scheduled to start at 7pm. It’s fun for the whole family with the CEFCU Kid’s Club as Macon Speedway will also be giving away two go karts to two lucky kids in attendance Saturday Night September 19th. Any kid ages 1-17 are eligible to win just sign up at the races and be present to win!